Kansas City is literally in the center of the growing national market for Data Center services and solutions. DataBank, with a history of service and support in the area, continues to make investments expanding it’s footprint and capabilities to three local Data Centers in order to meet growing demand. With a number of diverse sources for local energy generation, (coal, nuclear, and wind), the area boasts reliable and low cost energy. The area offers an abundance of enterprise opportunities as evidenced by the number of notable corporate HQs including AMC Theaters, Hallmark Cards, American Century Investments, H&R Block, and Black & Veatch. Kansas City is also home to strong entrepreneurial growth with a business friendly government offering numerous business incentives. Easy to see why is ranks in a CNBC study as one of the ‘Top States For Business’. Our South Lake facility is situated in the technology-rich, South Kansas City suburb of Lenexa, providing direct, on-site connectivity to several Tier 1 carriers. Powered by two separate substations with on-site, diesel-powered generators for backup, the data center includes 6,000+SF of space for customer equipment and advanced cooling technology. The Pine Ridge data center is located in the technology-rich South Kansas City suburb of Overland Park. The site houses DataBank’s primary Network Operations Center and operational support teams. With more than 12,000SF of raised-floor data center space, the facility houses three independent data halls and direct connectivity to multiple top-tier carriers. KC3 is the keystone of our South Lake Data Center Campus. This 28,000 sqft data center will augment the innovative and growing Kansas City market with a full range of colocation, cloud, and connectivity solutions. Tier III design, diverse utility power feeds, multiple network entry points, and multiple fiber providers all contribute to robust resiliency. 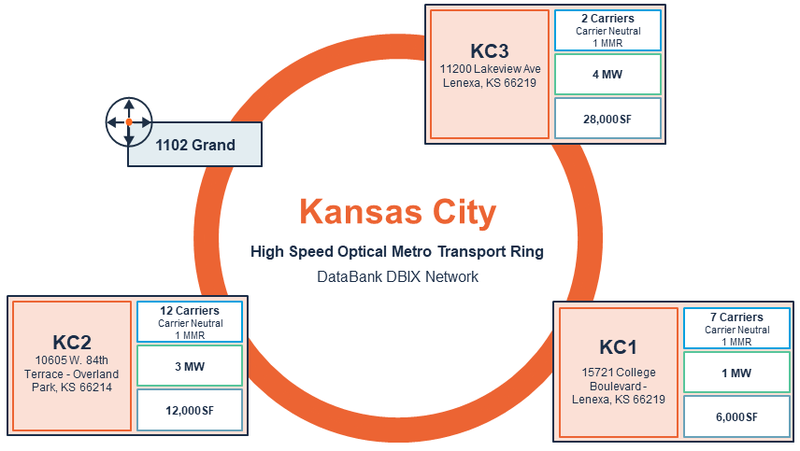 DataBank builds its own private fiber ring in metros with multiple facilities. We also connect to other carrier hotels within the metro.